1) This paper was prepared and presented as a keynote presentation at the FIG International Workshop 2008 ”Sharing Good Practices: E-learning in Surveying, Geo-information Sciences and Land Administration” in Enschede, the Netherlands, 11-13 June 2008. The economy of information society is based on the creation, dissemination and exploitation of data, information and knowledge. This will be one of the dominant features of this century, and will play a fundamental role in generating a recovery in growth and an increase in employment. The extended use of the potential offered by information and communication technologies (ICT) will create new service markets; will speed-up administrative and decision-making procedures. Developments in the ICT have also had a huge effect on the learning environments. For the period of 2007-2010 an FIG Working Group (WG 2.2) was established by Commission 2 (Professional Education) on e-Learning. The introduction gives an overview of the structure of Commission 2 and its mission and workplan for the period of 2007 – 2010. This paper aimed to be a discussion paper on the main objectives of WG 2.2 – e-Learning. What is e-Learning? By the simplest definition: e-Learning is a learning process created by interaction with digitally delivered content, network-based services and tutoring support. Adding more details on methodology: e-Learning is any technologically mediated learning using computers whether from a distance or in face to face classroom setting (computer assisted learning), it is a shift from traditional education or training to ICT-based personalized, flexible, individual, self-organized, collaborative learning based on a community of learners, teachers, facilitators, experts etc. Broadening our view wider: cultural and social impacts are key defining characteristics. e-Learning is a foundation of the globally networked and interdependent economy, which is advanced by ICT. The author presents the status, trends and the importance of business models of e-Learning. How have computers and internet changed our live? Well the society, science and technology around our profession are changing rapidly. We can search almost everything, learn and communicate anytime (24/7) and anywhere (mobile computing). The rapid developments of the last decades in surveying techniques, technologies and methodologies create growing need for continuous changes in education and an increasing demand for continuing professional development. In contrast to the field of Geographical Information Systems (GIS), in surveying there are only few training services offered mainly by instrument or software companies or by the academic sector (Willgalis, 2006). Today, the universities or companies - based on their own limited resources - are not able to respond the exponentially growing demands. There is a strong must for international cooperation in educational developments, however, contrary to the field of Geoinformation Technologies in our profession there are only few examples of these international co-operations, there is a lack of collaborations in networked education. One of the main reasons probably that the surveying community and our traditional market is relatively very small, but from the other side, there is a lack of broad “political” recognition of a “surveyor”, as defined by the International Federation of Surveyors (FIG). International programmes often sponsor Spatial Data Infrastructure developments, but the communication about the essential role of surveyors within SDI is not satisfactory. Coordinated marketing of the surveying profession is needed at an international level targeting both our clients and to the public (Mahoney et al., 2007). Endorsing universities and other educational organisations to explore the needs of society and to manage in a pro-active way the necessary changes in the “knowledge age”. Supporting academic institutions and industry with new methods of knowledge management, helping surveyors continuously to update their academic and professional profiles. Advancing educational business and curriculum tuning processes. Promoting content development experiences, facilitating international researches in surveying education and training and to initiate joint projects on this field (curriculum development, educational material development, joint courses, quality assurance etc.). Strengthening knowledge transfer between FIG Commissions, inspiring activities on knowledge networks. Improving dissemination of information on educational theory and practice to the members across the world. Reinforcing contacts to Educational Commissions of International Organisations on the related professions. WG 2.1 Curriculum development: Quality curriculum and instruction are - as they have always been - the bedrock of education and the way to developing thoughtful and competent professionals. The curriculum should ensure that the learners gain knowledge as effectively and efficiently as possible. WG 2.2 e-Learning: To successfully disseminate the knowledge, it is essential to have an up-to-date learning environment. Thanks to the development in information and communication technologies, there have been lots of possibilities and tools re-engineer the classical teaching methods. Because of e-Learning methods are expected to play an increasing role in professional education there is a growing need for knowledge transfer on this field. WG 2.3 Educational Management and Marketing: Knowledge dissemination is not only a methodological or technical problem. Institutes have to own the rights how the learning materials may be available for others, as well as taking commercial aspects into account. WG 2.4 Real Estate Valuation and Management Education: This is a joint WG with Commission 9 to ensure that the surveying education keeps up with the rapidly changing and challenging field of real estate development. Curriculum development, e-Learning methods and tools and Educational Management are strongly intertwined key issues for handling changes in professional education (Fig. 1). Curriculum development was discussed in our Prague workshop (Cepek, 2007). Our next workshop in Vienna (2009) is dedicated to Educational Marketing and Management. This paper aims to share my thoughts and to give an overview of the status and trends of e-Learning. make models of each student, i.e., a profile showing her/his background, learning needs, preferences in terms of teaching methods, and constraints. What is e-Learning? By the simplest definition: e-Learning is a learning process created by interaction with digitally delivered content, network-based services and tutoring support. This definition focuses on the revolutionary impact of network-enabled technology. Adding more details on methodology: e-Learning is any technologically mediated learning using computers whether from a distance or in face to face classroom setting (computer assisted learning), it is a shift from traditional education or training to ICT-based personalized, flexible, individual, self-organized, collaborative learning based on a community of learners, teachers, facilitators, experts etc. Blended learning is an integrated approach that applies a mix of e-Learning and traditional education. Broadening our view: cultural and social impacts are key defining characteristics. e-Learning is a foundation of the globally networked and interdependent economy, which is advanced by ICT. Learning, which generate knowledge in our brain, we remember lessons learned, and use if needed. Information support and coaching: while learning is directed at enhancing individual capacity, this function focuses on building external resources. Knowledge management, which aims to collect documents, practices, and solutions in an organized way, and facilitates wide distribution. Interaction and collaboration: ICT can be used to engage, blend, and stimulate learners. Guidance and tracking: new technology enables more and better guidance, assessment, tracking, and information. Learning management systems can guide individuals towards critical skills and assets to meet their needs. Learning services designed using learner-centred approaches, accommodate a variety of delivery methods and multiple learning styles. e-Learning cuts the costs, shorten product development cycles, less expensive to produce and maintain, reduces costs for the e-Learning service providers. Learning standards create interoperable objects that cut costs and development time. By developing jointly learning materials the expenses are relatively smaller. e-Learning programs can reduce the participation fees without negatively affecting the compensation for high quality presenters. Overall costs for learners, travel time and other associated costs are also reduced. Learning is self-paced, gives learners a chance to speed up or slow down as needed. Learning is self-directed, allowing to understand the content in an effective way. On-demand access, learning can happen when needed. Learning materials and most of the support are available 24/7. Learning does not require physical presence, however, fosters better learner/instructor contact. Promotes greater student interaction and advances collaboration. e-Learning uses interactive technology to develop fun, engaging, effective simulations. Collaborative learning in the online environment is often far easier and more comfortable than in the classroom. Companies can share working experiences, staff members can quickly learn the inner technologies and techniques. e-Learning systems allow team members at collaborating companies to understand shared objectives. Drive business transformation or change. New processes can be implemented faster with an educated staff. Employers can train staff members to handle sophisticated tasks without risking production quality. Learning, education and training on new technologies and methods increase employee efficiency and collaboration, improve computer and Internet skills, knowledge sharing keeps skills current. Geographical barriers of learning are eliminated. e-Learning opens global opportunities. The technologies allow the ability to use tools and resources that are impossible in a traditional educational system. In e-Learning technology innovations have expanded from the stand-alone computer-based content to cover a range of management, delivery, and collaboration technologies. During the 1990s, networking advances, together with the rise of the Web and its supporting technologies, and the emergence of learning-management systems (see Fig. 3). Synchronous collaboration tools, which allow to share a “virtual classroom” over Internet-protocol networks. Online-learning authoring tools, collaboration tools, and systems for assessing and testing learner skills are helping in value addition. Most recently learning objects platforms are the new wave of innovation, offering the benefits of granularized learning that users can repurpose for different audiences and personalize for individual learners (Barron, 2002). An active role for learners, contributing content and knowledge, making connections, and building relationships for informal learning enabled by technology. Shift from read to write: more and more learners are contributing content and knowledge. Combination of pull and push: content, knowledge and connections are increasingly relevant and personal, driven by a company’s and an individual’s personal and/or professional needs. Open, unstructured content in various formats and different media (increasingly in audio and video format) and found through search. Involvement with realistic tasks; Interactions with peers or facilitators; Opportunities for feedback and self-evaluation. Human interaction is a critical component for learning. Face-to-face contact is still not comparable with virtual meeting. There are situations in which classroom training cannot be replaced. Certain content because of its nature, importance is not suitable for pure e-Learning. Blended learning is an integrated approach that applies a mix of e-Learning and traditional education or training delivery options to teach, support, and sustain the skills needed for learner’s competencies. With blended learning, the tried-and-true traditional learning methods are combined with new technology to create a synergetic, dynamic learning structure that can boost learning to better results. The educational institutions are under intense pressure to get the best course to their learners, in the right format, at the right time, for the right price and, very importantly, in the required quality. To do this, they have to spend considerable time and resources on planning their supply strategy to respond to the demand of the industry or society. This goal can only be reached if the organisations introduce a usable and innovative tool, which serves the above mentioned requirements. This tool must enable networked educational partners to work together across different and possibly flexible platforms. Moreover it must support the sharing of management and technological information (Katz, 2002). Learning platforms are software-controlled learning infrastructures that attempt to replicate what teachers do in the face-to-face classroom. These platforms are normally located on a computer on the Internet (or an Intranet) and are typically accessed by means of a Web browser. Within the last decade numerous e-Learning platforms (e.g. Blackboard, Hyperwave, Ilias, Metacoon, Moodle) were developed with different concepts and supporting different operating systems. Most of them offer a wide range of functionality for the publication of documents, for promoting the interaction between lecturers and students, and for administration purposes. The systems have features, like electronic assignment submissions, virtual areas for group work, self-assessment quizzes and online testing, tracking specific student activity, poll, glossary, survey, discussion forums, and links to external web-sites (Mansberger et al, 2006). Developers still focus on one of the segments of the Learning environment. The platforms allow academic staff and learners to go through the processes that what we'd expect to encounter at the traditional campus (e.g: student enrolment, induction and support, ticking the class attendance roll, chalk and talk combined with class discussion, practice of skills, assessment etc.). A rigid replication of the traditional campus delivery model is an intermediate solution. Learners need to be equipped with more contemporary skills such as logic, initiative, self-directedness and online research skills. This requires a complete re-think as to how online platforms are designed. Interoperatibility should also be handled as on the most important issues in system design. Marketing functions are as follows: supporting needs analysis, research of the dynamic educational market, promotion of e-Learning, enquiries from prospective learners, PR, demand maintenance. The management subsystem should help conceptualisation (serving information for the mission, strategy and objectives). It also deals with HRM (motivational aspects for the author, workload issues (when, and how intensively can the author work), guarantee for continuity (no hire and fire); knowledge management; building relationship, networking and quality management (definition of quality levels, selection of appropriate contents, handling of accreditation issues, communications assuring quality). Finally, the information infrastructure (gateway hardware, software, consideration of organisational setting of content developers, authors, knowledge-base backup etc.) must be managed. Building knowledge resources (content development) supports original developments, knowledge mining (searching from metadata-bases, searching from public data), uploading learning units and their metadata, copyright), maintenance and archive of the knowledge base. Course production starts with learning path definition. This subsystem ensures accreditation, recognition and certification, dealing with terms and conditions, course calendar, course maintenance, and it has an FAQ section. Administration arranges academic administration (enrolment, accounting, certificates, placements and alumni), course administration (content data, course backup, student’s, tutor’s, author’s data) and financial administration (contracts, ensuring IPR for authors). “Portal” is a term for a World Wide Web site that is, or proposes to be, a major starting site for users when they get connected to the Web or that users tend to visit as an anchor site. “Portal” is often used as a synonym of gateway. 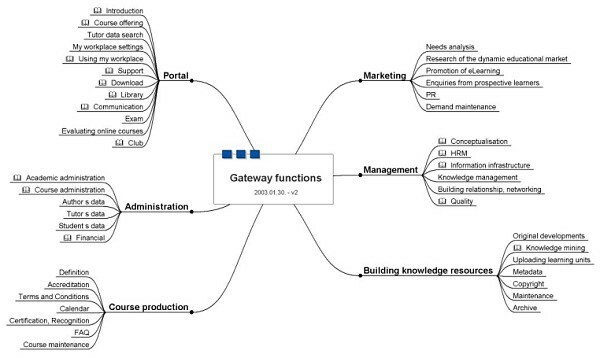 In our interpretation, the portal is a subsystem of the educational gateway with the following data and services: introduction, contacts, overview, press, news, events, course offering (next course, learning advises, opportunities, achievements), “my workplace” settings, using the workplace (selecting the right PC, selecting an Internet Service Provider (ISP), solving technical problems, learning how to learn online, access to modules, assignment upload: auto path, name, marking, feedback, progress info, grades). Other typical support services of the portal are: help desk, FAQ, tutoring, mentoring, download (free software, public data, and publications), virtual library (papers, presentations, and links), communication with tutors, instructors, collaboration with other students. The portal also serves for examinations, evaluating courses, building a virtual club, collaborative learning and for job offering. The growth of the Internet, followed by the use of intranets, groupware and learning environments, has highlighted the problem of standardisation. People want to find content easily wherever it might be on the Internet, and incorporate it into their courses; learners want to move between institutions taking their learning records with them; and educationalists using e-Learning systems want to have good information support from administrative systems. In fact, achieving these is key to the realisation of a global education marketplace (Cetis, 2004). Currently, a fundamental issue is the emergence of two technological developments: standards and open source software. These two together will facilitate creativity; and foster the accumulation of innovation and activity within an administration and learning environment. collaborative learning based on a community of learners, experts, facilitators, etc. In education the adoption of different forms of e-Learning has led to radical shift in the power politics of education not only in terms of providers but also particularly at the level of the teacher-student relation. The old hierarchical structure is breaking down as globally we see shifts along a spectrum from didactic education to communities of learning (Petch, 2006). From focusing on the local learning environment and its available educational tools, the universities are now facing a new situation, where the students just under their fingertips have access to the global pool of knowledge. Consequently, not only the role of the teacher is changing, but also the whole university organization and the principles of learning in relation to both methodology and pedagogy. The role of the universities will have to be reengineered based on this new paradigm of knowledge sharing (Enemark, 2006). The ability of students to connect with experts around the world, as well as their group members, also opens new opportunities for learning and professional development. Students and tutors find these opportunities motivating. Distributed instruction, the explosive expansion of networks is a general trend. Whatever the revolutionary changes in technology, the learning is the vital element. The teaching is not enough, it is the active (or proactive) learning, which is essential (Markus, 2005). Educators will be confronted with their changing role in e-Learning environments. While technology-based learning will unlikely able to completely replace the university education, it offers more opportunities for corporate training and continuing studies. However, the role of educators will change: they will become more and more facilitators, providing dynamic update of knowledge databases, transparent and clear syllabi, reading recommendations, etc., and offering guidance and motivation strategies for students who should get used to self-organized study approaches (Seufert, 2001). Because of the cost of using e-Learning tools decreasing, more universities, governments, companies have added online courses and other forms of distance learning to their organizations (WorldWideLearn, 2008). Based on literature review we can identify the following fundamental trends that will influence the growth of e-Learning over the next decade. Changing skills require new initiatives. Daily tasks evolving faster than universities can produce qualified experts, many employers apply constant, on-the-job training to remain competitive. E-learning programs help staff members to obtain new skills and critical improvements quickly and efficiently. Market offers quick start options. Institutions can lease or purchase turnkey e-Learning systems on low budgets, or can implement free open source e-Learning. As e-Learning processes become more standardized, clients benefit from shared research and development expenses. Companies integrate e-Learning into mainstream. More and more organizations exploit intranets to increase communication and productivity. They can easily integrate learning modules into staff communications, and can add similar tools to web-based systems. At the same time the modular nature of e-Learning content allows employees to learn at their desks gradually, in their own pace. e-Learning classrooms open the world. We are only starting to see the effects that quality education is having on business and industry in developing countries. Likewise, small businesses can access the same level of information and insight that was earlier only available to large companies. Mobile technology helps e-Learning initiatives. Wireless technology allows educators to reach learners in their working environment. With radio, satellite, and Wi-Fi signals beaming two-way information from distant people can participate in an almost endless array of learning opportunities. Governments support e-Learning. Governments around the world have discovered that e-Learning programs can dramatically improve the quality of life for citizens while reducing the financial burden on taxpayers. Governments in developing countries have invested heavily in e-Learning programs. a description of the sources of revenues. Culture: In the e-Learning model students or employees can assess skill gaps and access knowledge as they need it. Learning can occur at their home, office, or any other Internet- or intranet-accessible location. But transitioning from face-to-face training to e-Learning is a major cultural shift that will not carry on without the full support of senior leadership. Determining whether content is suitable for e-Learning requires close inspection of the learning objectives. No amount of streaming video, audio files, or colourful pictures will compensate for poorly designed programs that fail to promote fundamental educational objectives. Capability involves the wide spectrum of computer hardware, infrastructure, IT support, and instructional design. Internal capability should support multimedia technology to fully optimise e-Learning programs. Other capabilities that need development are instructional design support and follow-up strategies. Cost: A key step in determining the cost of an e-Learning initiative is to find out if tracking and reporting capabilities are already available or need to be developed or purchased. The creation of quality e-Learning material creates a cost dilemma, since it has both high variable and high fixed costs. The reduction of the fixed costs can be achieved by reuse, rapid production, ease of updating and cost-effective pedagogy (Weller, 2004). Clients: Successful e-Learning initiatives require strong marketing that begins long before the actual implementation date. All potential learners need to be aware of the rationale for and benefits of e-Learning opportunities, and they need to be encouraged to seek out and complete programs that address their key development needs. Recently, the traditional players, such as universities, see themselves confronted with international competitors not only from their field, but also from the hard- and software industries, which establish corporate and virtual universities. The line between academic and corporate training is blurring: many universities investing on continuing education as well and cooperate additionally with e-Learning vendors (Seufert, 2001). An appropriate business model is a critical issue in any course delivery. New business models assure to radically change the educational services and greatly improve the effectiveness of knowledge delivery. e-Commerce also changes how we teach and learn, it is more about redesign the strategy than technology. The consortium agrees on an exchange of e-Learning courses on a non-fee basis. Each partner provides a single e-Learning course, in return getting access to free courses from the partnership. Partners choose a course topic in which they have special expertise, which reduces development time and increases quality. Each course is based on an existing course and available teaching materials. Partners deliver a complete course including tutoring. The consortium uses an existing e-Learning platform of one of the partners. The business model above was successfully applied and provided feasible e-Learning courses with low costs and resources. The same basic approach will be examined in another, recently started e-Learning project (Brox et al, 2006). The business model of re-using and sharing resources could support to build sustainable courses within other networking partnerships. To disseminate the knowledge, it is essential to have up-to-date learning materials. Thanks to the development in information technology, there have been many possibilities and tools replace and renew the traditional teaching methods. Thus the e-Learning methods are expected to play an increasing role in professional education. Today, the universities or companies - based on their own limited resources - are not able to respond the exponentially growing demands. There is a strong demand for international cooperation in educational developments, however, contrary to the field of Geoinformation Technologies in our profession there are only few examples of these international co-operations, there is a lack of collaborations in networked education. The IT revolution holds great promise and presents great challenges. It will be difficult to control but impossible to resist. We must transform all traditional institutions of learning to prepare students for their future. In addition to the basic skills of a profession, every learner should be a master in communication, collaboration, and creative problem solving. Systems will be more “learner centred” in the sense that they will offer learners and teachers / trainers global access to online resources and assessment strategies, enable learners to interact with learning objects, teachers, tutors, mentors, administrative and service resources, and enable learners to tailor the learning experience to their needs. Original educational objects, expertise and knowledge can be incorporated to add value to learning resources acquired elsewhere. Course planners and teachers can acquire learning objects from large content databases, and aggregate and manage these according to the needs of particular groups of learners by selecting the appropriate mode of delivery. Learners will be able to fulfil their educational needs by choosing from a world-wide list of educational / training institutions. Collaborative learning will enable learners to establish their own learning groups focused on their common interests. New business models promise to radically change the educational services and greatly improve the effectiveness of knowledge delivery. The most important ones are customisation and community building. The web links students, professionals, alumni etc. and allows for new ways of communication and interaction. e-Business also changes how we teach and learn; it is more about redesigning the strategy than the technology. International programmes often sponsor Spatial Data Infrastructure developments, but the communication about the essential role of surveyors within SDI is not satisfactory. Coordinated marketing of the surveying profession is needed at an international level targeting both our clients and to the public. As a consequence our education and training activities should target not only the surveying professionals, but also our potential users. They should cover a wide range from awareness building to advanced skills for scientific researches. These are the main reasons why we need joint activities to solve the above mentioned problems. Barron, T., 2002: Evolving Business Models in eLearning, Summary White Paper, SRI Consulting Business Intelligence, http://www.sric-bi.com/LoD/. Brox, C. - Painho, M. - Bação, F. - W. Kuhn., 2004: International Exchange of e-Learning Courses". Proceedings of the 4th Seminar on GIS Education, Villach, Austria. Brox, C. – Riedemann, C. – Kuhn, W., 2006: Exchange of complete e-Learning courses – First experiences with a business model, Proceedings of the 5th Seminar on GIS Education, Cracow, Poland. Brunner-Maresch (2002): NODE project documents, 2002. Cepek, A., 2007: Scientia est potentia, Proceedings of FIG Commission 2 Workshop, Prague. Enemark, S., 2006: The e-Future Challenge, Proceedings of E-Governance, Knowledge Management and e-Learning, FIG Workshop, Budapest, Hungary, 11-21. Katz, R.N. ed (2002): Web Portals and Higher Education, A publication of EDUCAUSE and NACUBO, Jossey-Bass, San Francisco, USA. Mahoney, R. - Plimmer, F. - Hannah, J. - Kavanagh. J., 2007: Where are we heading? The Crisis in Surveying Education and a Changing Profession. FIG Working Week, Hong Kong SAR, China. Markkula, M., 2006: Creating Favourable Conditions for Knowledge Society through Knowledge Management, e-Governance and e-Learning, Proceedings of FIG Workshop, Budapest, Hungary, 30-52. Markus B., 2002: Spatial Knowledge Management in Land Administration, FIG Congress, Washington DC, USA. Markus B., 2005: Learning pyramids, FIG Working Week, Cairo, Egypt. Mansberger, R. – Bauer, T. – Heine, E.: Flop or Top - Experiences with E-Learning in Academic Education, Proceedings of E-Governance, Knowledge Management and e-Learning, FIG Workshop, Budapest, Hungary, 293-306. Muggenhuber, G., 2006: Knowledge Management as a useful tool for implementing projects, Proceedings of E-Governance, Knowledge Management and e-Learning, FIG Workshop, Budapest, Hungary, 215-222. Petch, J., 2006: All things ‘e’: understanding the real challenges in an accelerating world. Proceedings of E-Governance, Knowledge Management and e-Learning, FIG Workshop, Budapest, Hungary, 53-65. Rosett, A., 2002: The ASTD E-Learning Handbook, McGraw-Hill, New York – San Francisco, USA. Timmers, P., 1998: Business Models for Electronic Markets. Electronic Markets, Vol. 8, No 2, 3-8. Weller, M., 2004: Learning objects and the e-learning cost dilemma, Open Learning, Vol. 19, No. 3. Willgalis, S., 2006: Economic Solutions to Changing Professional Training Requirements in Geodesy and Surveying, FIG Congress, Munich, Germany. 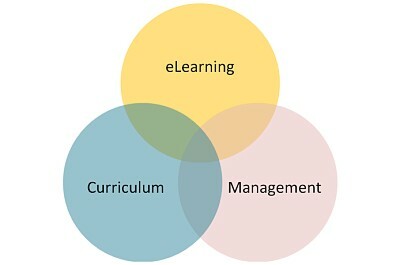 WorldWideLearn, 2008: New Dimensions in Education, http://www.worldwidelearn.com/elearning-essentials/elearning-benefits.htm. Bela Markus is a land surveyor, M.Sc., Ph.D., professor of Geoinformatics, and dean of the Faculty of Geoinformatics, University of West Hungary. He has 37 years teaching experience in surveying, 20 years in teaching GIS and 15 years in development and organization of open, distance learning professional courses for land administration. Prof. Markus has over hundred publications on various aspects of using computers in surveying, spatial information sciences and educational developments. He is actively involved in many national and international academic programmes, chairman of the National Committee of Association of Hungarian Surveyors and Cartographers, chairman of the Hungarian UNIGIS Course Board. Prof. Markus is chairing the International Federation of Surveyors (FIG) Commission 2 – Professional Education and member the Board of Directors of FIG Foundation. He is also member the Executive Committee of EUROPACE (Leuven, Belgium).